Habit: Shrub 30--60 cm. Stem: intricately branched, short-rough-hairy, sparsely gland-dotted. Leaf: alternate, petiole 1--2 mm, blade 3--12 mm, 1--4 mm wide, oblong to spoon-shaped, entire, base acute to acuminate, tip obtuse to acute, faces tomentose, veins obscure. 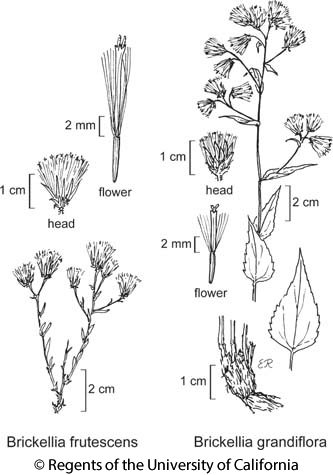 Inflorescence: heads 1--3; peduncle 10--30 mm, long-soft-wavy-hairy, gland-dotted; involucre 9--11 mm, cylindric; phyllaries 20--25, in 5--6 series, often purple-tinged, 4--5-striate, outer lanceolate to ovate, ciliate, inner linear-oblong, tip rounded, mucronate, margin narrowly scarious, faces sparsely long-wavy-hairy, gland-dotted. Flower: 20--30; corolla 6.5--7.5 mm, +- purple. Fruit: 3.5--4.8 mm, minutely bristly; pappus bristles 26--30. Citation for this treatment: Randall W. Scott 2012, Brickellia frutescens, in Jepson Flora Project (eds.) Jepson eFlora, http://ucjeps.berkeley.edu/eflora/eflora_display.php?tid=1811, accessed on April 23, 2019.